These are my favorite sugar cookies! This recipe makes a simple, versatile vanilla sugar cookie; the dough is easy to roll and to work with and doesn’t spread when baking, so your cookies will always have sharp, defined edges! You can decorate these cookies with sanding sugar, or you can use my recipe below for a simple (and tasty!) 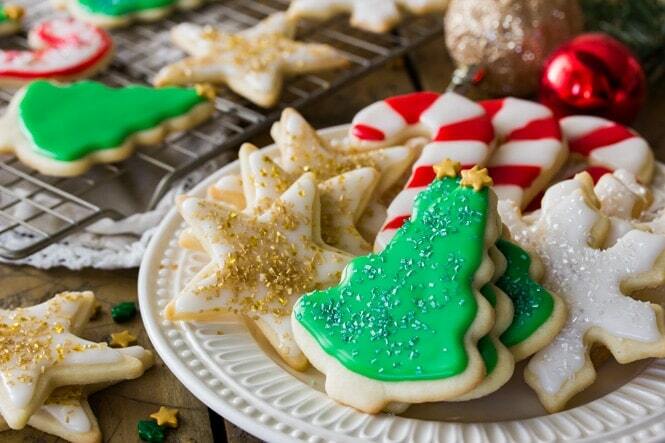 pipeable vanilla sugar cookie frosting. This is just a friendly reminder that Christmas is officially less than one month away, so if you aren’t freaking out yet about not having all of your Christmas shopping done, or even started, now is the time to start freaking out. Wait. Breathe. Have a (sugar) cookie. I’m trying not to freak out, but I have 1 husband and 7 family members (plus two birthdays before Christmas) that I need to buy for just on my side. They’re also aggressively hounding me to know what I want for Christmas, and my wish list currently has exactly two items: This gorgeously colored KitchenAid that I definitely don’t need because I already have one in an equally gorgeous color (affiliate), and like 6 of those robot vacuum cleaners (affiliate) (because three dogs! )… Affordable options for my 12 year old sister, right? If you have any baking must-haves that I need on my list, send them my way! 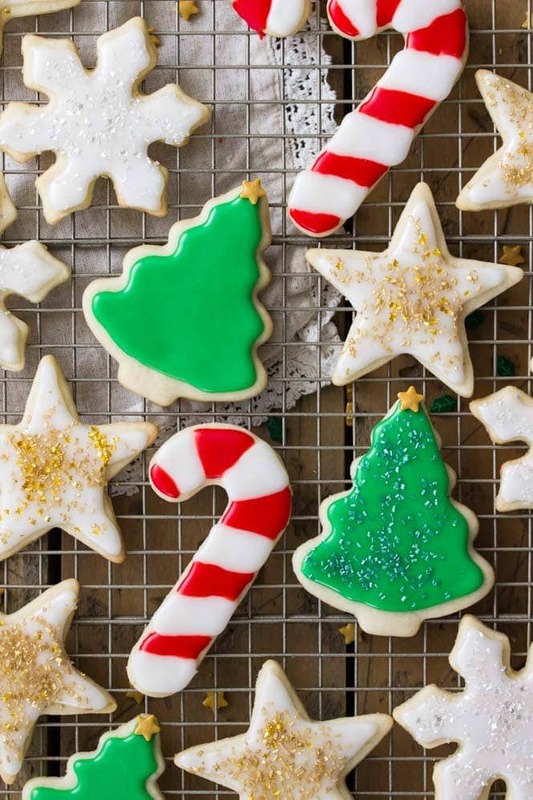 While my gift buying situation is not at all under control, I at least have the Christmas cookie situation locked down with this easy sugar cookie recipe. I started working on this recipe a long, long time ago, but made myself wait until after Thanksgiving to finally share it. These are easy cut-out vanilla sugar cookies and are destined to be your future cookie platter staple. Sugar cookie dough always shocks me with its simplicity, it only calls for a few ingredients and no fancy techniques. When you first make your dough, it will be a bit sticky and tough to manage so you are going to need to chill it before you can roll it out. I divide my dough into about two equal parts, wrap each in cling wrap and form it into a disk, then chill for 2-3 hours (though you can certainly chill it overnight, or even make it several days in advance). I know, I know, chilling is a pain. I played with some no-chilling-required recipes, though, and this recipe that required chilling beat out all of my no-chill sugar cookie recipe versions, so trust me when I tell you that the wait is worth it! It also makes your dough very easy to manage when it comes time to roll it out, simple and frustration-free. For the frosting for these cookies, I did not use a royal icing, which I know is popular. Truthfully, I don’t really love the taste of royal frosting, and I know many of you don’t keep meringue powder in your cabinets or feel comfortable making egg white frosting. Instead, I used the same frosting that I used for my Galaxy Cookies, it’s easy to make, easy to pipe, and dries hard for stackable cookies. This recipe uses light corn syrup (which is not the same as high fructose corn syrup!) for a nice shiny frosting. I frosted my cookies and then topped a few of them off with colored sugars, but if you want to skip the frosting you can sprinkle your cut-outs with sanding sugar just before baking. This is the way my mom always makes her sugar cookies, they still taste delicious! When cutting out your sugar cookies, make sure to keep your cuts as close together to get as many cookies out of your dough as possible. You will want to re-roll any scraps so that you use all of your dough, but with each re-roll you’re adding more flour into the dough, so you want to get as much as possible out of that first roll. Bake cookies that are about the same size together. Otherwise the small ones will burn and the large ones won’t finish baking. For thinner, crispier sugar cookies: Roll cookie dough thinner (about 1/8″) and look for the edges of the cookies to be turning golden brown to know that they are done. For thicker, softer sugar cookies: Roll dough to about 1/4″, and watch for cookies to be just beginning to turn lightly golden around the edges. Let them cool completely on the cookie rack as they may break if you try to move them while they’re still warm. When making the frosting: It’s hard to mess this one up, because if you make it too thin, just add more powdered sugar, and if it’s still too thick, just add more milk! Alright, that’s how you make perfect, easy Sugar Cookies from scratch. Hopefully you guys love cookies as much as I do because I have so many more coming up this month that will be great for your holiday cookie platters (especially excited to share my gingerbread cookie recipe — coming soon!). If you like my sugar cookies, make sure to try out my chocolate chip cookies! 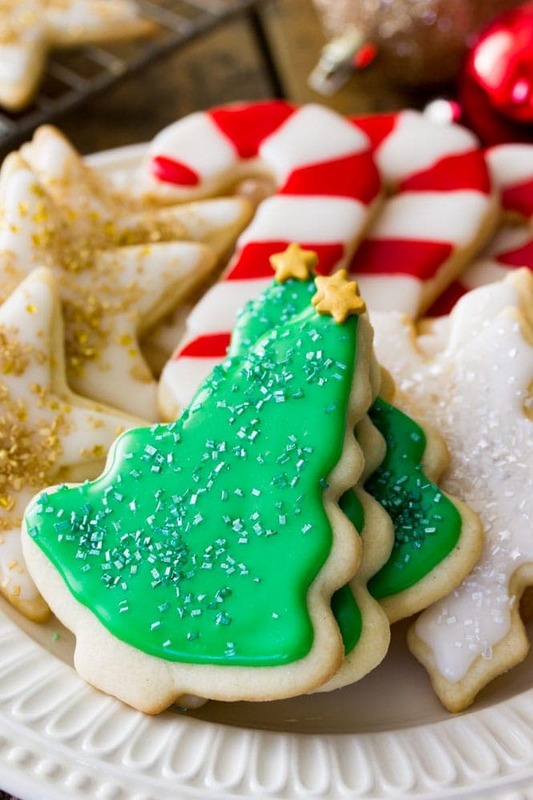 This is a great and easy recipe for Sugar Cookies and a sugar cookie frosting. Combine butter and sugar in the bowl of a stand mixer (or in a large bowl and use an electric hand mixer) and beat until creamy and well-combined. Add egg and vanilla extract and beat until completely combined. Gradually add dry ingredients into wet until completely combined. Lay out a large piece of plastic wrap and transfer approximately half of the dough onto the wrap (dough will be quite sticky at this point, that's OK!). Once dough has finished chilling, preheat oven to 350F (175C) and line a baking sheet with parchment paper. Set aside. Generously dust a clean surface with flour and deposit one chilled cookie dough disk onto the surface. Lightly flour the dough and roll out to 1/8" (for thinner, crispier cookies) or 1/4" (for thicker, softer cookies). Continue to add flour as needed both on top of and beneath the dough so that it doesn't stick. Bake on 350F (175C) for 9-10 minutes5, or until edges just begin to turn lightly golden brown. Allow cookies to cool completely on cookie sheet before moving and frosting. Combine sugar, 2 Tablespoons of milk, corn syrup, and vanilla extract in a medium-sized bowl and stir until combined. If frosting is too thick, add more milk, about a teaspoon at a time, until the frosting is thick but pipeable. If you accidentally add too much milk, add powdered sugar until desired texture is reached. If coloring the frosting, divide into bowls and color as desired at this point. Transfer frosting to a piping bag with a piping tip (I used Wilton 5), or place in a Ziploc bag and snip a small piece of the corner off (not as neat, but this will still work, just take care that the frosting isn’t so thick that it breaks open the seam of the bag when you are squeezing). 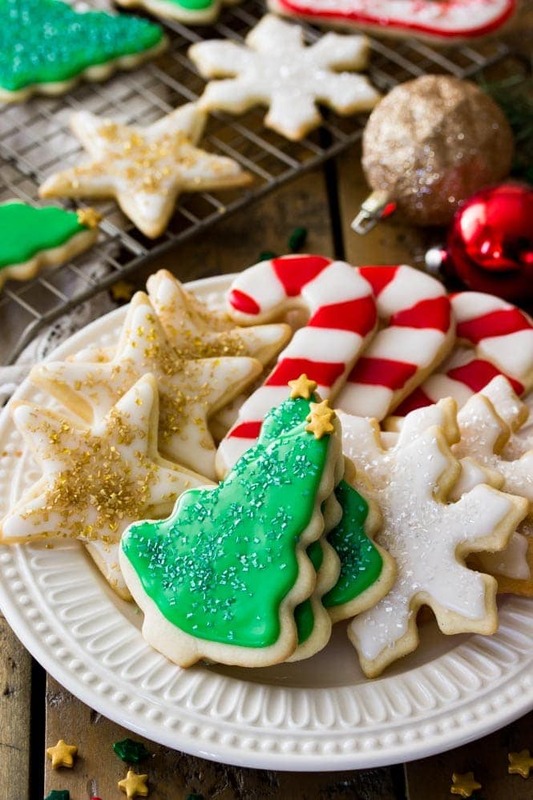 Pipe frosting on cookies and decorate with decorative candies, if desired. Keep uneaten cookies sealed in an airtight container at room temperature. *Yield varies greatly depending both on how thick you roll the dough and the size of the cookie cutters that you use. This recipe can be doubled. (3) You may chill this dough longer, overnight or even up to several days. If the dough is too firm to roll out and starts to crack, let it rest at room temperature for about 10-15 minutes before continuing to roll. (4) If you don't intend to frost your cookies, then you can just sprinkle them with sanding sugar for decoration at this point. 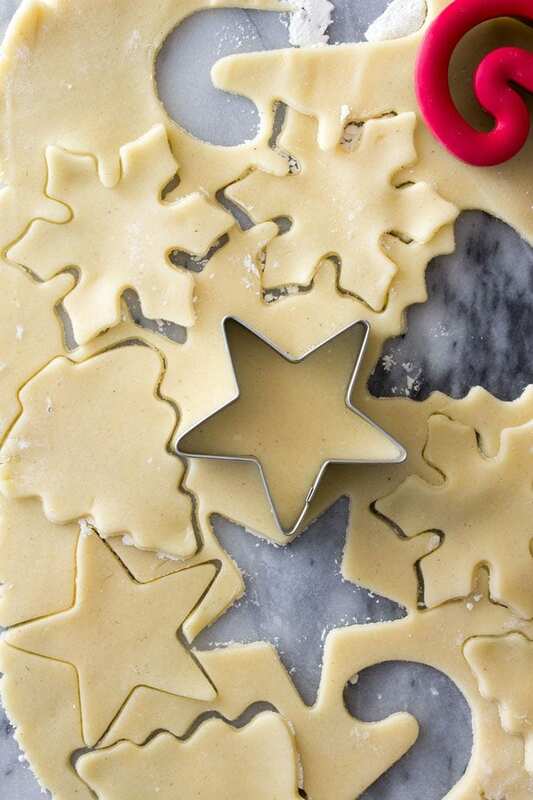 (5) My cookie cutters were about 3" in length, if you're using smaller cookie cutters you will need to bake for less time, keep an eye on the edges of your cookies to know when they are done. I filmed myself making these cookies LIVE on my Facebook page 11/30. Here is the re-play! Previous Post Turkey Pot Pie — Great for Leftover Turkey! Can you tell me how this is different from royal icing? I looked up so many recipes and just want something that will taste great. Few weeks ago I used powder sugar, water and vanilla extract. To decorate my cookies for first time! It was kid approved 😂 but i always wonder if there’s something better. Since it was my first time using any icing for my cookies. I have read recipes using same ingredients but maybe minus the corn syrup. Does this recipe taste more like a frosting then icing? Hi. Any advice on making chocolate decorating icing? I can’t wait to try this recipe!! It looks so good. The only problem is that only powder-form food coloring is available here… no gel, unfortunately. Do you think powder will work?